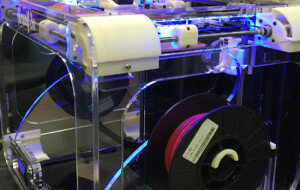 PAWTUCKET, RI, U.S.A., April 1, 2015: New compounds in the award-winning Terraloy® high-impact, high-heat polylactic acid (PLA) range of products provide enhanced properties and tight tolerance control in 3D printing, while permitting oven drying of filament to prevent defects caused by residual moisture, it was announced today by Teknor Apex Company. The Bioplastics Division of Teknor Apex introduced the Terraloy® 3D-40040 Series compounds at the company’s NPE2015 exhibit. In addition, Edwin Tam, manager of new strategic initiatives, presented a technical paper on the compounds during the Society of Plastics Engineers (SPE) ANTEC Orlando 2015, which was co-located with NPE. His presentation was entitled High Heat and High Impact Poly(Lactic Acid) Compounds for Additive Manufacturing / 3D Printing. Formulated for extrusion into filament for use in 3D printers, Terraloy® 3D-40040 compounds have improved heat deflection temperature and impact strength compared with standard PLA and make possible tighter tolerance control after annealing. Because of its heat resistance, filaments made from the compounds can be easily dried in an oven before processing—an important advantage because of the hygroscopic nature of the standard PLA polymer. Terraloy high-heat, high-impact PLA compounds are based on innovations by Teknor Apex that have overcome an inverse relationship in standard PLA between heat distortion temperature (HDT) and Izod impact strength. The new products exhibit up to two times the HDT and more than four times the impact strength of standard PLA resins. Previous work to enhance PLA performance beyond standard levels had generated resins with either higher HDT or greater impact strength—but not both in the same grade. Recently Teknor Apex received two awards for the Terraloy technology: the “Innovation in Bioplastics Award” from SPI: The Plastics Industry Trade Association; and the “Bioproduct Innovation of the Year Award” from Ohio State University’s OBIC Bioproducts Innovation Center.